Winking Earns Her Top All-Around Score of the Season at Regionals — Gem City Gymnastics & Tumbling, LLC. 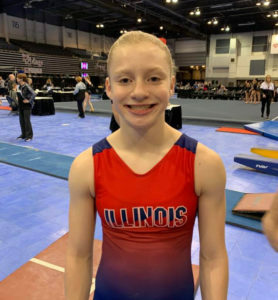 Ava Winking earned her best All-Around score of the season at the USAG 2019 Region 5 Championships in Battle Creek, Michigan, this weekend. She finished in 13th place in the All-Around. We missed our other Level 9 qualifier, Haley Woodyard, as she is recovering from a minor setback. We are SO proud of our Level 9 girls and the long season they had. They cheer for one another, support one another, and train side-by-side six days a week. Additionally, Ava and Haley are both honor students at school as well. he Level 9 gymnastics team coaches include Jacob Huff, Hope Huff, and Kiki Backoff. You can read more about Gem City’s gymnastics program here.